FINALLY, a daily painting in the works! 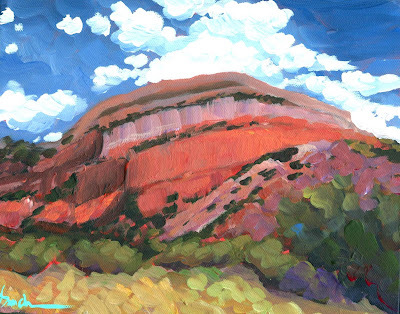 I am finishing up commissions but I was really feeling the need to paint something new and since I just took a trip to Jemez....here it is! It should be finished tomorrow. Saturday is my day trip to Tesuque, Chimayo, and Abiqiui, I am so looking forward to that. I will take tons of pics and hopefully some video. Goodnight! I love this one just as it is here. I know the lines will add a lot, but this very loose painting is wonderful.